The Ad Council’s “We Are America” commercial, part of the Love has no labels campaign, is one of the nominations for Most Outstanding Commercial at this year’s Emmy Awards. 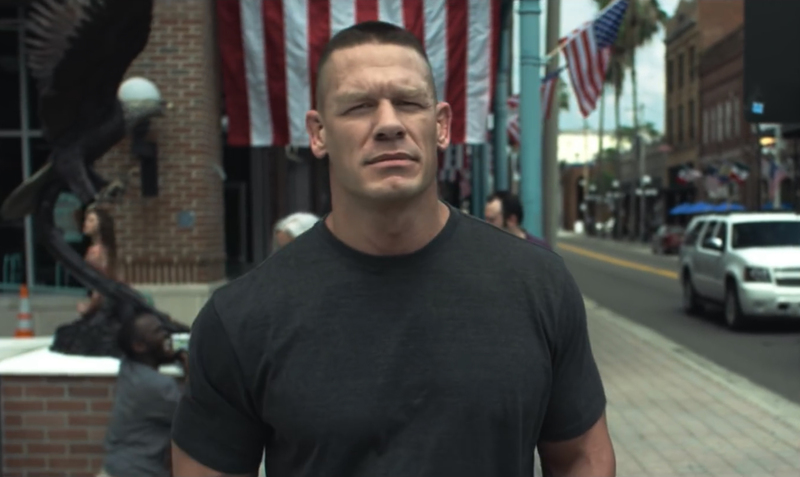 Launched for Independence Day 2016, the We Are America ad featured American professional wrestler, rapper, actor and reality television show host John Cena reflecting on patriotism and love of country. Having invited his viewers to close their eyes and imagine the typical American, he proceeds to walk through the streets, providing statistics on the exceptions to the white male stereotype with representatives of these groups appearing in the background. The commercial celebrates love and acceptance of all communities regardless of race, religion, gender, sexual orientation, age and ability. The commercial was supported by a wide-ranging digital campaign, including an opportunity for people to submit photos to demonstrate the diversity that makes up America. The Ad Council’s introduction to the YouTube video: “While the vast majority of Americans consider themselves unprejudiced, many of us unintentionally make snap judgments about people based on what we see – whether it’s race, age, gender, religion, sexuality, or disability. The Love Has No Labels campaign challenges us to open our eyes to our implicit, or unconscious, bias and work to stop it in ourselves, our families, our friends, and our colleagues. Rethink your bias at www.lovehasnolabels.com“. The Ad Council was able to partner with major American brands, including Coca-Cola, PepsiCo, Procter & Gamble, Unilever, State Farm, Google, and Johnson & Johnson. 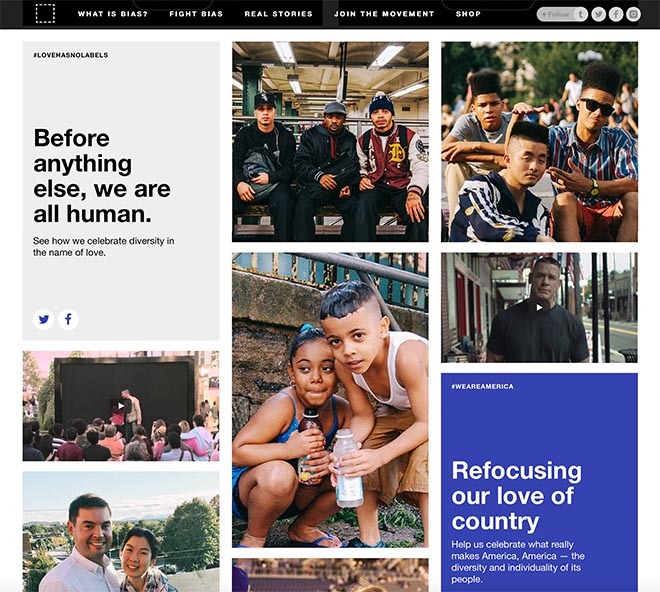 The We Are America campaign was designed to encourage Americans to define their love of country as love of all Americans and to challenge the assumptions of what defines an ‘average’ American — likely different from the person imagined. The spirit of inclusiveness is evident in the labels that Americans use to define themselves — Latino, disabled, lesbian, Muslim, senior citizen, African American and others. “At a time when it feels hard for our country to find common ground, we need to remind audiences that to celebrate America is to celebrate all Americans. We’re so proud to continue the Love Has No Labels message as part of the 4 July holiday and throughout the year,” said Lisa Sherman, president and chief executive of The Ad Council. To ensure that the PSAs represented the right diverse perspectives and addressed the issue of implicit bias, The Ad Council enlisted The Perception Institute, Southern Poverty Law Center and Anti-Defamation League. The We Are America campaign’s online socialisation was supported by Upworthy, Facebook, Twitter, Buzzfeed and WWE, driven by the #WeAreAmerica hashtag. In addition to Cena’s participation, WWE leveraged its global platforms including WWE Network, television broadcasts, live events, and digital and social media to support the campaign. Ad Council staff on the campaign were director of client services Priscilla Natkins, campaign manager Heidi Arthur, campaign director Trace Danicich and Jenn Walters, assistant campaign manager Madeline Miller, PR and social media team Ellyn Fisher and Shirley Yeung. The We Are America campaign was developed at R/GA by global chief creative officer Nick Law, group executive creative directors Eric Jannon and Chris Northam, associate creative directors Thomas Darlow, Rene Van Wonderen, Lucia Orlandi, Paul Wood, Eduardo Quadra, Shashank Raval, senior visual designer Bethany Kennedy, designer Ria McIlwraith, experience designer Tessa Ndiaye, junior art director Emily Uram, junior copywriter Lukas Pearson, executive production director Cindy Pound, executive production director Cindy Pound, executive campaign producer Jeff Shutnik, digital producer Lucas Dennison, group strategy director Dylan Viner, strategy director Dave Surgan, senior social strategist Emily Kearns, strategist Amy McEwan, executive technology director Micah Topping, lead architect Josh Hansen, senior QA engineer, senior software engineer Wade Wojcak, global chief marketing officer Daniel Diez, PR director Suzanne McGee, business affairs director Stephen Bernstein, executive production director Kat Friis, post producer Leanne Diamond, senior content producer Ashlye Vaughan, business affairs senior manager Joanne Rotella, stills photographer Shima Green, business affairs coordinator Madeline Gioia, art producer William Morel, associate producer Danielle Sessler, and production assistant Shakirah Tabourn. Filming was shot by director Rocky Morton via MJZ with director of photography David Lanzenberg, executive producer Emma Wilcockson, line producer Larry Shure. Editor was Dan de Winter at Rock Paper Scissors. Visual effects were produced at Nice Shoes by colourist Chris Ryan and Flame artist Jason Farber. Sound was mixed at Nylon studios by Dave Robertson. Music was supervised by Wool & Tusk. Original music was by Phillip Glass at Human.